Painting Prints and photo prints now for sale!!! Over the past three years I have struggled to find the path that God has planned for me as I try to make a living for myself. During this time of struggle all that I really knew for sure was that God loves me, that he is guiding me, and that he wants me to make art. And finally, I am excited to say, he has answered my prayers and lead me to move to Houston to teach and make art. I am leaving very soon and so I decided that my last painting should be a tribute to my hometown of Austin, Texas, that I love so much. 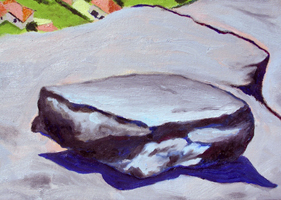 This painting was inspired by the beautiful view on top of Mt. Bonnell. I thought that this was a perfect image not only because it captures the beauty of Austin but also because it references an earlier painting of mine called "Waiting". "Waiting" was made at the end of 2004 at the height of stressful times in my life. I painted the 360 bridge in Austin rush hour traffic in the painting because I liked the idea of waiting to overcome an obstacle because that was my experience at the time. 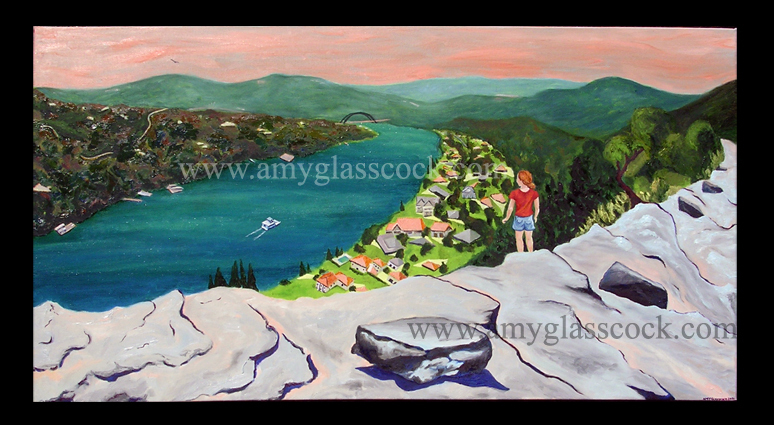 The same bridge (360) is in the distance in this painting as I (the figure in the painting) look back and see that I am now on top of the mountain on the other side of the river. I have now overcome the obstacle and am at peace. "I find I am so excited I can barely sit still or hold a thought in my head. I think it's the excitement only a free man can feel, a free man at the start of a long journey whose conclusion is uncertain...I hope." - from the film The Shawshank Redemption. "Even when answers slowly unwind it's my heart I see You've prepared. washing away my pain." -Lyrics by Jeremy Camp.